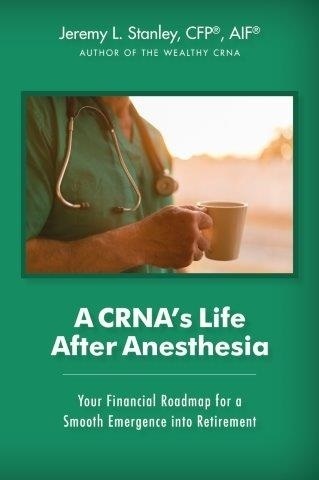 A CRNA’s Life After Anesthesia is the newest book from financial planning expert Jeremy L. Stanley, CFP®, AIF®, and is designed to assist CRNAs in planning for retirement. A CRNA’s Life After Anesthesia begins by describing the current career landscape for CRNAs. Recent healthcare policies and population shifts have resulted in significant changes to the medical industry. It is important to understand how these changes can impact your future. Next, Jeremy asks readers to describe their vision of retirement. Where do they want to live? What do they want to do? He shows them how to determine whether that vision is realistic given their current financial situation. Jeremy also teaches the fundamentals of planning for retirement and lists the most common mistakes when it comes to financial planning. In addition to retirement planning, the book includes information on estate planning and how to leave a legacy for your loved ones. Enjoy a book tailored to your specific profession and career path. Wherever you are in your career, CRNAs will find this book a helpful manual in working toward financial security. This program, available at Amazon.com, has been prior approved by the American Association of Nurse Anesthetists for two Class A CE credits; AANA Code #1033793; Expiration Date 9/30/19. After you have read the book, click here to visit the test center. Use access code “smoothemergence"